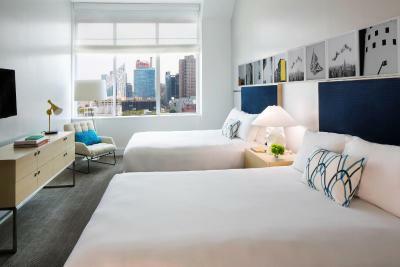 Lock in a great price for Kimpton Ink48 Hotel – rated 8.7 by recent guests! Very close to the cruise ship pier. Great bed. Large bathroom. Great restaurant-Landmark Tavern-one short block away. This is a beautiful hotel and very modern. The food was really good.....expensive, but good. The room was comfortable and a good size for New York. The views of the city were magnificent. Room needs remodeling and is getting dated and run down. There’s a club outside that blasted music til 4 am. Here in business and did not sleep a wink. Room size very good . Trendy lobby/furnishings . Excellent staff, cool boutique hotel, great farm-to-table restaurant with amazing service and decor, huge bathrooms and very quiet location. Honestly we have stayed in many hotels in NYC over the years and the bathroom was the size of many other hotel rooms! The staff was helpful and friendly. We were pleasantly surprised how nice the rooms were. The beds were extremely comfortable. We also enjoyed the lovely rooftop lounge as well as complimentary wine tasting before dinner. We walked to the theater district for some shows. It was close enough without being in the crowded Times Square area. It’s Location to Javits 8 blocks away where I was attending a trade show. 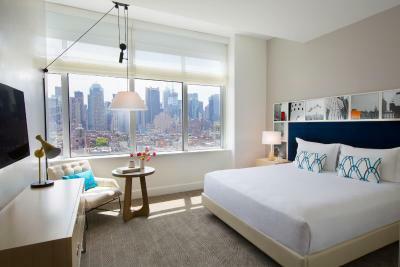 Kimpton Ink48 Hotel This rating is a reflection of how the property compares to the industry standard when it comes to price, facilities and services available. It's based on a self-evaluation by the property. Use this rating to help choose your stay! This boutique hotel in New York City is 1.1 mi from Central Park South. 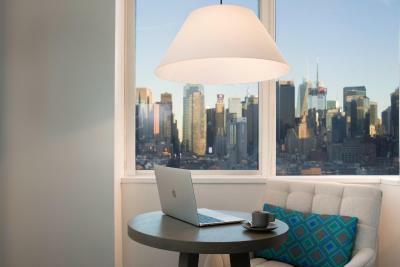 This eco-friendly hotel features the glass-enclosed PRESS Lounge with outdoor seating, PRINT restaurant and guest rooms provide Manhattan views. 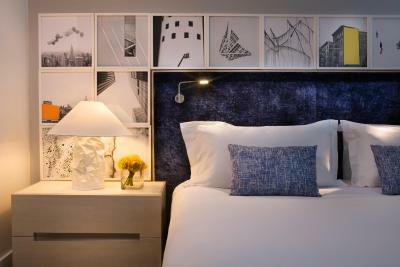 The Kimpton Ink48 Hotel features rooms with flat-screen TVs and iPod docking stations. 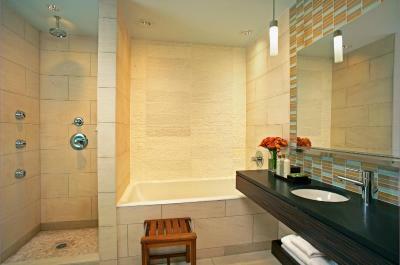 Designer bath amenities and in-room spa services are also available. Guests at Kimpton Ink48 can work out in the 24-hour fitness center or visit the full-service spa. Morning coffee and tea service is available daily. An evening wine hour is offered from 17:00 - 18:00 daily at Kimpton Ink48 Hotel. 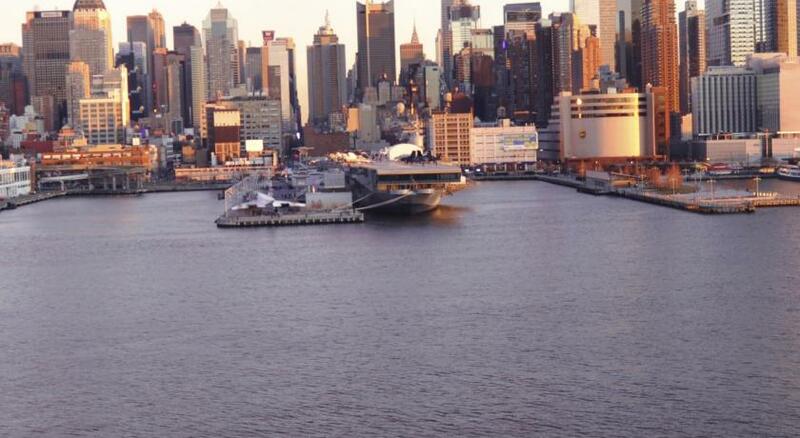 Jacob K. Javits Convention Center and Times Square are 0.7 mi from Kimpton Ink48 New York City. 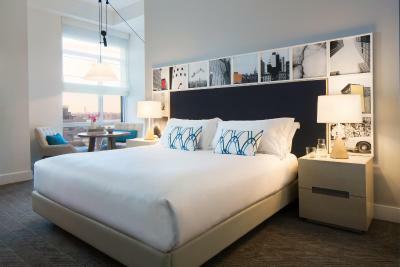 When would you like to stay at Kimpton Ink48 Hotel? Located on floors 2-6, this room features a flat-screen TV, mini-bar and work desk. Located between floors 6 and 15, this room offers city views and features a flat-screen TV, mini-bar and private bathroom with free toiletries. 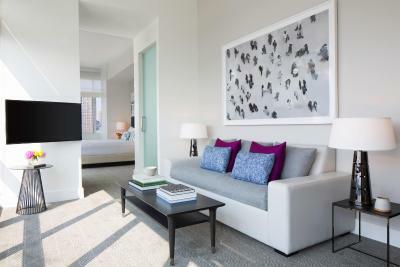 This 1-bedroom suite offers a seating area with a chaise lounge and a flat-screen TV. It includes a bathroom with double vanity basin, shower and soaking tub. 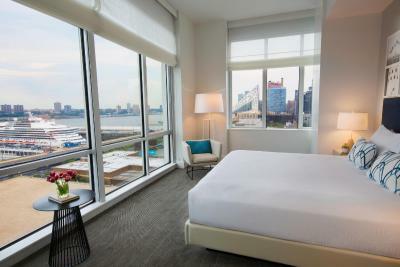 Located between floors 7 and 15, this suite offers views of the Hudson River and NYC skyline. This studio features a sitting area, minibar and private bathroom with a soaking tub. 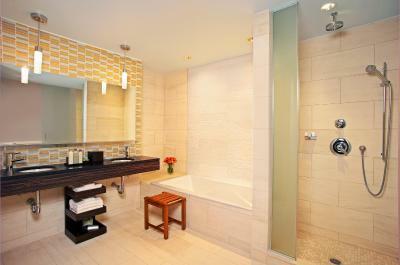 This room features a flat-screen TV, mini-bar and private bathroom with free toiletries. This suite features a flat-screen cable TV, bathrobes and a mini-bar. 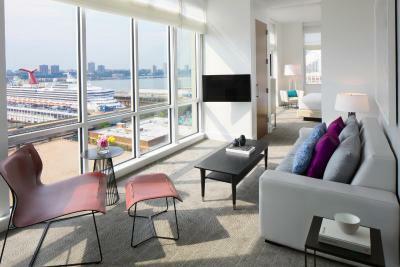 Located between floors 6 and 15, it also offers a view of the Hudson River. This accessible room is located on the higher floors offering city views and features a flat-screen TV, mini-bar and private bathroom with free toiletries. 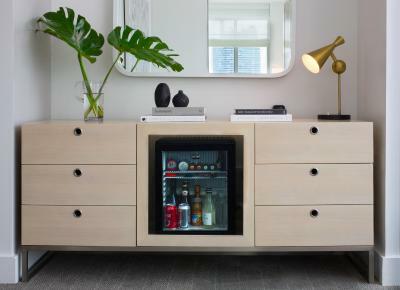 This accessible room features a flat-screen TV, mini-bar and work desk. 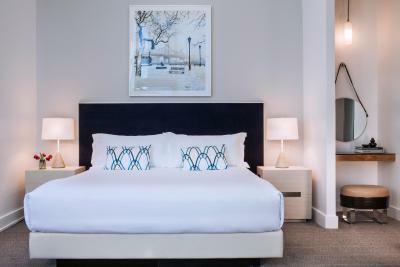 The sleek rooms and suites feature minibars, city views and free WiFi. Suites add separate living areas. Upon entering, guests are treated to a spacious and light-filled room complemented by unobstructed views of Manhattan’s skyline, afforded by expansive windows and high ceilings. The new rooms evoke a modern-day loft with neutral color palettes and unexpected pops of color, drawing urban nomads and sophisticated travelers seeking a luxurious yet unpretentious environment for work or play. House Rules Kimpton Ink48 Hotel takes special requests – add in the next step! Kimpton Ink48 Hotel accepts these cards and reserves the right to temporarily hold an amount prior to arrival. WiFi is complimentary for Kimpton rewards members. Contact the property for more information. No coffee in the room. Service very depending on who was working. Some were really nice. But others, We hope improve! Black out screens do not work well. Need repair! The only problem was the noise level. The hotel has a popular bar so around 4am, when it closed, patrons were very very loud upon leaving. For whatever reason they chose to honk their horns for about half an hour. That was annoying. Not sure what the hotel can do about that, but they probably should try. They woke me up both mornings we were there. Pressure in shower could be better. Some of the staff were extremly helpful, both in the front desk, And restaurant. However others were not very serviceminded, sounded annoyed If you were to Ask something in the early Evening, by phone. Service is everything! We had stayed here before and returned for the roof top terrace. We learned at checkin that the terrace had been booked for a wedding. That was a total bummer. There is major construction going on for the next year right across the street, so any room on the 11th St side should be avoided at all cost. After the first night, which was made miserable when the ceaseless jack-hammering and truck back-up beeping started at 7am, I was moved to a side room close to the back side of the hotel (near the river) and that was better, but still not quiet or restful. Hoping that this morning, Saturday, would be quieter, I was disappointed that yet another construction project was in full swing at 7am. The room was well appointed. The restaurant is outstanding. The staff was accommodating when a problem arose. There is tremendous amount of very loud construction happening directly across the street from the hotel and specifically where our room was located. Three large jack hammer tractors started at 7am in the morning and continued till at least 6pm each day of our stay. The staff was less then sensitive about the situation. You could not utilize the room during these hours. With this level of predictable loud construction, some type of notification should have been provided before making the reservation. We were on second floor and was very noisy outside. If we were on higher floor would have been better. Very clean and up to date. Rooms very nice.